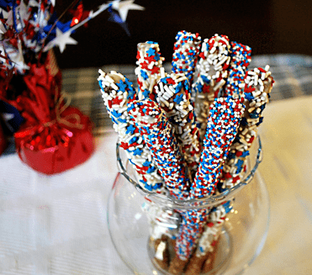 Whether you're hitting up a 4th of July party, or just hanging at home with the kids, you should 100% try these festive red, white, and blue chocolate-dipped pretzel rods from Cafe Mom. They're super easy to make, and they are delicious! They're bound to elicit "oohs" and "aahs" when you show up to a barbecue with a box full of 'em.